Is it possible to improve on perfection? Can BMW go any further in the AWD market than they already have with the X3 and X5? Can they come up with anything more? The answer to this is “yes, they can.” With the X6, BMW have done it again. Tear drop shaped and elegant, this is a sports activity coupe with style. Muscular and manly haunches boast twin exhaust pipes that are quadrilateral in design. Without much ado – the BMX X6 is a real looker! 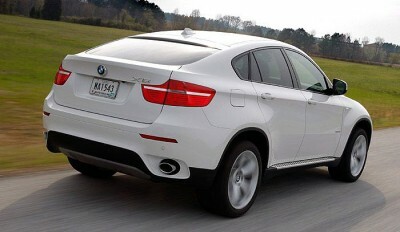 The BMW X6 is a coupe and an SUV all in one smooth, sporty package. The Dynamic Performance Control distributes the driving power between the two rear wheels, thus helping traction to be obtained and the security that maximum grip offers – particularly in the wet. With a V8 twin turbo engine, the BMX X6 is a motor vehicle that is not lacking in serious grunt. You only need to read the words V8 and “twin turbo” to grasp the lethal power that the BMW X6 can deliver on demand for the driver. However, the thumping power outputs of the BMX X6 are refined in nature and cleverly harnessed by combining the combustion engine with twin electric motors. These electric motors provide the marriage of both power and efficiency that modern day technologically advanced motor cars strive for. BMW know only too well that to capture the heart of the driver, the driving experience needs to deliver excitement and thrust, and yet this experience should not be at the expense of excess fuel. The two batteries in the BMX X6 are incorporated into a cleverly designed circuit that offers brake energy regeneration. As soon as you brake or take your foot off the BMX X6’s accelerator, kinetic energy is fed back to the batteries. This reduces the load on the engine and, as a result, reduces fuel consumption. The BMW X6 is available with the very smooth, powerful and award winning straight six twin turbo petrol engine. Also available are two different six cylinder diesel power plants that prove to be very efficient and aptly torquey for those who require power for towing. The flagship of the BMX X6 range is undoubtedly the new V8 twin turbo petrol engine boasting a husky and harmonious 300kW. The explosive levels of torque peak at 600 Nm and are available, at full throttle, from engine revs touching a mere 1750 rpm. Wow! This muscle tugs the solid BMW X6 xDrive 50i from 0-100 km/h in just 5.4 very quick seconds. The BMX X6 has capable AWD drivetrain that was designed to go from autobahn to Swartzwald with ease. Ground clearance in the BMX X6 is higher than in a regular BMW saloon, but isn’t as high as it would be in, for example, a Range Rover. It’s good for general town-to-country running rather than riverbed running – but you’re not likely to take the BMX X6 where it’s going to get scratched and battered because it looks so good! On the inside, the BMX X6 has all the comfort and safety that a German car should have. The rear seats are generous with plenty of headroom, the boot’s capacious enough to swallow up heaps of gear. One special little detail newly introduced for driver comfort in the BMX X6 is the addition of kneepads, so if you like to sprawl and relax in the driver’s seat (of course you do! ), then you won’t bang your knees against the sides of the centre console. For any more information on the BMW X6, or for that matter any other new car, contact one of our friendly consultants on 1300 303 181. If you’d like some fleet discount pricing (yes even for private buyers! ), we can submit vehicle quote requests out to our national network of BMW dealers and come back with pricing within 24 hours. Private Fleet – car buying made easy!